Combine Philly*, 2 tablespoons dressing, garlic and some thyme. Set aside to marinate. Place tomato halves onto a lined oven tray, sprinkle with a little of the dressing, thyme leaves and some black pepper. Bake for 20 minutes at 160ºC. Add prosciutto slices to tray and cook a further 5-6 minutes until crispy. 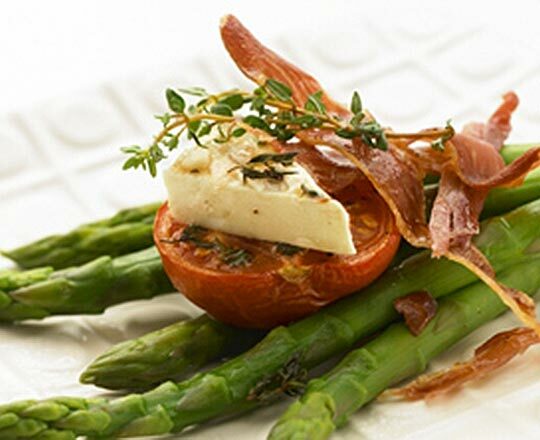 To serve, place asparagus spears onto serving plate, top with a tomato half, prosciutto and a slice of Philly*. Drizzle with remaining dressing.